"We are taking Newport last more for convenience in the arrangement of the book than from motives of precedence or any other consideration. Newport is the capital of the Isle of Wight, the county town, the market town, the centre of civil and legal associations, and, being nearly the centre of the Island, it is easily approached from all parts - by train, road, and river from Cowes; by train and road from Ryde, Sandown, and Freshwater; and by road from all the country districts. It is close to Carisbrooke, in part forming a portion of its civil parish. It is seven miles south-west from Ryde, twelve from Freshwater in the west, nine from the Niton coast in the south, ten from St. Helen’s in the east, and five from Cowes iii the north. It stands on either side of the river Medina, which is navigable up to the town. Carisbrooke declined in favour of Newport because the latter is more conveniently situated for commerce. Camden thus refers to the town “Newport, the principal merceate toune of the whole isle, in times past Medina and Novus Begus de Meden.” The Medina runs at the foot of the eastern side of the town, and the Lukeley rivuIet waters the western side and joins the Medina at the town quay. Gas is supplied by a company and water by the Corporation. The central station for several railways is situated here, the whole of the services being under the management of Mr H. Simmons. The Newport and Cowes line was opened to the public in 1862, Sandown to Newport 1875, Ryde to Newport 1876, Freshwater to Newport 1889. Newport was incorporated in the time of James I., and a governing charter was granted by Charles II. The Corporation comprises Mayor, six Aldermen, and eighteen Councillors. Before the Reform Act was passed Newport returned two members to Parliament. Afterward one member was allowed, but the borough was deprived of this privilege by the Act passed in 1885 for the Redistribution of Seats. The Parish Church (St. Thomas the Apostle) was re-built in 1854, and the foundation stone was laid by the late Prince Consort on the 24th of August of that year. It is a handsome Church in the Early Decorative style, and consists of north and south chapels, a chancel, nave with gabled aisles, vestry, north and south porches, and a handsome tower at the west end. This contains clock with chimes and a peal of eight bells. In 1793 the vault containing the remains of the Princess Elizabeth, daughter of Charles I., was discovered near the site of the communion table, a stone with the initials “E.S.“ marking the spot. This Princess, as we state elsewhere, died in Carisbrooke Castle in 1650, about 18 months after her father had been beheaded. In 1856 Queen Victoria had a splendid monument of white marble sculptured by Marochetti, representing the Princess in a recumbent attitude, and this was placed in the new Church of St. Thomas. The Modern Intelligencer, bearing date, Tuesday, September 10th, to Wednesday, September 18th, 1650, thus records the death of the Princess: “Thursday, September 12. - This day came certain News from the Isle of Wight of the death of Lady Elizabeth Steuart, daughter of the late King, who being at bowles, a sport she delighted much in, there fell a sudden shower, which caused her to take cold, being of a sickly constitution she fell into a feverish distemper, which notwithstanding the care and industry of that faithful. gentleman, Mr Antony Mildmay, & all the art of physicians, being naturally of a weak body, & her fever growing sharp upon her, she departed this life on Sunday, the 8th of September.” By the same sculptor a beautiful monument of the Prince Consort was prepared at the expense of the inhabitants and erected in the church. Two fine stained windows, the gift of the Queen and the Prince Consort, are also to be seen, and a monument of Sir Edward Horsey, who was captain of the Island in the 16th century. The building is capable of seating 1,400 worshippers. St. John’s Church is associated with an ecclesiastical parish formed from Carisbrooke in 1836. It was built of stone in 1837, at a cost of about £4,500, and capable of accommodating 800 people. The Congregational Church is in Lower St. James’s street. It was originally built in 1699, but re-erected on modern lines in 1848. It can accommodate about 500 worshippers. The Wesleyan Chapel in Pyle Street contains 650 sittings. In a small room formerly used by this body John Wesley preached when he visited Newport on the occasion of the sailing experience which he records with graphic delineation in his journals. The Castlehold Baptist Chapel is at the west end of High street. It cost about £2,000, and was built in 1812, to accommodate 570 worshippers. The Bible Christian Chapel is in Quay street, opposite the Town Hall. It was erected in 1880, and can accommodate 550 worshippers. The Friends’ Meeting House is in the High street, nearly opposite the Post Office. The Primitive Methodists meet in Pyle street, the chapel being capable of holding 320 persons. The Brethren also have a meeting house. The Unitarian Chapel is in the east end of High street, not far from the Town Hall. The Salvation Army, who formerly met in a store near the Quay, now have barracks in Lugley street. The Roman Catholic Chapel, in Pyle street, was erected in 1791, and cost about £3,000. It provides accommodation for 500 worshippers. The Town Hall, situate about the middle of the town, close to St. Thomass Church, was erected in 1816 at a cost of about £10,000. The pillars and cornices are of Bath stone, the rest of the building is of brick, the whole cemented over and painted. The lower portion of the building is used as a market place, store rooms, and fire engine house. The upper portion is divided. The main hall is fitted up as a justice room, and here also the Isle of Wight County Council meetings are held. In this hall is a large statue of Chief Justice Fleming, who was born in the Isle of Wight in 1574, Recorder of London in 1594, Solicitor-General in 1595, an Exchequer Baron in 1604, and Chief Justice in 1607. Across the front is the Guildhall, a room set apart for the meetings of the Newport Town Council. In this room hang some valuable paintings - ancient and modern. In commemoration of the Queen’s jubilee, 1887, the town erected a clock tower of stone at the south-west corner of the building. One of the most interesting institutions of Newport is the Grammar School in St. James’s street, which may at any time be inspected, we doubt not, by permission of the Head Master, Mr H. A. Rumbelow. This school was established in 1614-19 by Sir Thomas Fleming, Sir John Oglander, and other Isle of Wight gentlemen, for the education of fifteen (increased to twenty) foundation boys, entering at seven or eight, and remaining till fifteen years of age. The income for the maintenance of this foundation is derived from the rent of three houses in Newport and between 30 and 40 acres of land at Hunny Hill. This ancient school has quickly taken its place as an important seat of learning since the appointment of the present Head Master. A new schoolroom has been erected in part of the playground, abutting Lugley street. Boarder are accommodated in the house and another house close at hand has been also taken for this purpose. The grounds are spacious and well stocked with fruit, and the lawns and foliage make the establishment, though in the heart of the town, a delightful country residence. The old portion of the building is sacredly preserved. In the days of Charles I. this house was his residence for 61 days, and he dated his correspondence from it as “From our Court at Newport.” Here it was that his Majesty signed the Treaty of Newport at the Conference with the Parliamentarians, and tradition points to the table on which the document was signed. The Isle of Wight Club rooms are situated in St. James’s square. The building cost £3,000, and was erected in 1810. Newport Literary Society and Museum have headquarters in Quay street. There is a good library, with a line collection of curiosities. The Jubilee Free Club, in Lugley street, was founded by the late Mr Charles Seeley, J.P., of Brooke, in commemoration of the jubilee of the Queen’s reign, and is now supported by his son, of the same residence. Hunny Hill is a suburb on the north side, of the town, with Dodnor about two miles in the same direction. At Dodnor, on the west bank of the river Medina, are situated the cement works of Messrs Charles Francis, Son, and Co., Limited. Barton’s Village is a suburb on the east side of the town, in the Whippingham parish. St. Paul’s Church at Barton was erected in 1844 at a cost of £2,040. It provides 400 sittings. The cemetery is near this place. Staplers is not far from this point, and near here is also an important establishment for the training of domestics and nurses, as well as a home for aged ladies, founded and maintained by Mrs. Harvey, of the Cliff, Shanklin. St. Nicholas parish is partly in Newport and partly in Carisbrooke. The ancient Church of St. Nicholas is in the Castle, and is now in ruins. 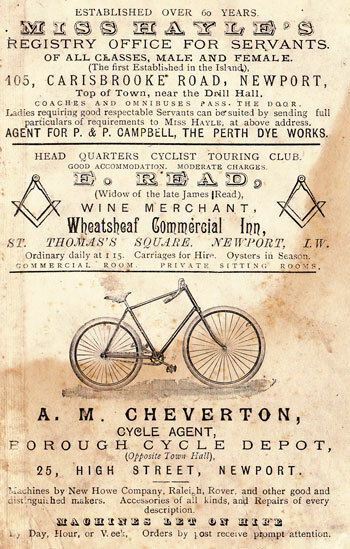 Letters dispatched from Newport 8.50, and 9.55 a.m., 12.20, 2.40, 4.0, 4.45, and 7.30 p.m., and for local deliveries 11.30 a.m., 5.30, and 10 p.m. Upper St. James’s street office, dispatched at noon and 7 p.m. "